SCOTTSDALE, Ariz. – Jan. 25, 2017 – Barrett-Jackson, The World’s Greatest Collector Car Auctions®, was this year’s place to be for sightings of megastars and supercars during the 46th Annual Barrett-Jackson Scottsdale Auction, held Jan. 14-22, 2017, at WestWorld of Scottsdale in Arizona. On Thursday, Rock and Roll Hall of Famer Steven Tyler roared onto the stage in his rare 2012 Hennessey Venom GT Spyder. The crowd went wild when Tyler rolled onto the block standing in the passenger seat with music pumping, lights flashing and Craig Jackson behind the wheel. Grammy award-winning singer and songwriter Justin Bieber and pro championship boxer Floyd Mayweather were both met with thunderous applause and cheering fans as they took their turns on the auction block. Some of the celebrities spotted during the auction were the cars themselves. John Lennon’s Austin Princess, which was used in the rock and roll legend’s 1972 documentary film “Imagine,” crossed the block on Saturday. A 1980 Pontiac Firebird Trans Am identical to the one featured in “Smokey and the Bandit II” was accompanied to the block by its owner, Burt Reynolds, star of the cult classic movie. Before the auction doors opened, the entertainment was already well under way. Barrett-Jackson teamed up with Pennzoil and World Championship drifter and professional “fun-haver,” Vaughn Gittin Jr. to film “No Reserve Drifting,” an adrenaline-pumping video shot at Barrett-Jackson’s longstanding auction site, WestWorld of Scottsdale. Throughout the 76-acre site, Gittin is shown piloting his 2017 Monster Energy Nitto Tire Ford Mustang RTR through harrowing hairpin turns and calculated donuts that demonstrate his natural dexterity behind the wheel. 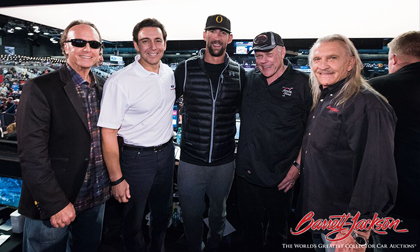 Some stars even made an appearance the evening before the collector car auction began at Barrett-Jackson’s renowned Opening Night Gala, which this year featured performances by the London Essentials and the Montreal Rhapsody Orchestra. NASCAR great Dale Earnhardt Jr.
Consignments are now being accepted for the 15th Annual Barrett-Jackson Palm Beach Auction April 6-8, 2017, at the South Florida Fairgrounds. For information on becoming a bidder, follow the link to https://www.barrett-jackson.com/bid. Information on available packages and how to be a part of this world-class lifestyle event is available here.